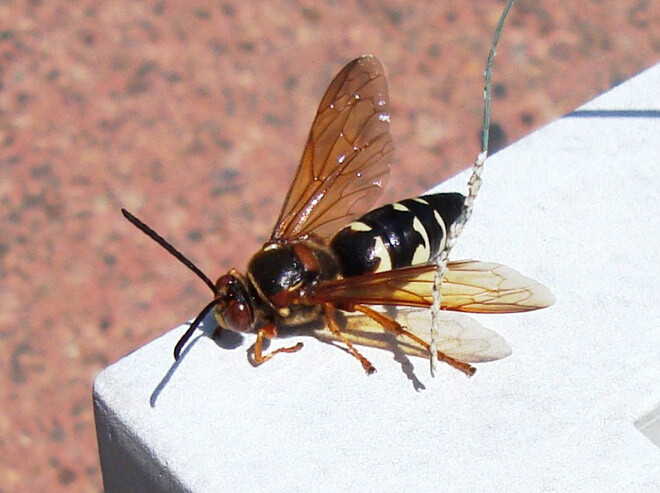 I have been living with Cicada Killer Wasps for 35 years now. They show up on time every year July and August and live in the same area's of my large patio year after year. I am writing to you this year because I noticed that this summer(July 2011) there are many more, and are much much larger (they are large to begin with) and appear to be a little more aggressive. Normally I just walk through them but this year I seem to be going around them. I know they will not bite/sting me unless provoked but this year I'm not so sure! any thoughts? Thanks for the cool photos of Sphecius speciosus in Framingham. 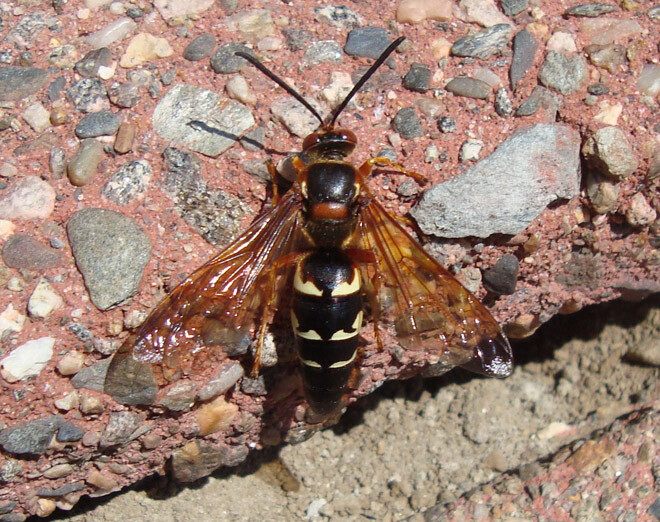 I will try to put some insight into why you are seeing so many cicada killer wasps this year. As you may or may not remember, last year was an unusally hot summer and cicadas were very abundant. 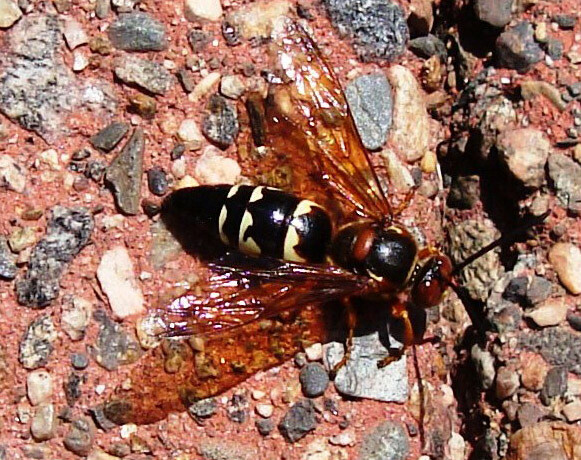 The reason you see cicada killer wasps every year in the same place is because for every year you see them, it is the offspring of the female cicada killer wasps from the previous year. Since last year was an abundant cicada year, female cicada killer wasps were able to bring at least two cicadas per egg that they laid. You see, it is the female cicada killer wasp that determines the gender of its offspring. If the female wants to have a female cicada killer wasp, then it will bring that egg/larva two cicadas to feed upon. If the female wants a male, it will only bring that egg/larva one cicada. The reason your crop of cicada killers seem larger is because there are probably more females than previous years. It doesn't matter if they seem more aggressive. Chances are its just the males "posturing". Their bark is worse than their bite quite frankly because males have no stingers and cannot sting. Females are extremely non-aggressive. The only way a female will sting you is if you accidentally stepped or sat on one. I'm curious, are the burrows close by?